For other uses, see Saint Elmo (disambiguation) and San Telmo (disambiguation). By 1417, the local militia had already established a permanent watch post on the tip of the Sciberras Peninsula. In 1488, the Aragonese built a watchtower on Saint Elmo Point, and it was dedicated to Erasmus of Formia, better known as Saint Elmo. In 1533, the Order of Saint John reinforced the tower due to its strategic location. In 1551, an Ottoman raid occurred in which the Turkish fleet sailed into Marsamxett Harbour unopposed. Due to this, it was decided that a major expansion was necessary, and in 1552 the tower was demolished and a new star fort began to be built. It was designed by four Italian architects and had a cavalier, a covertway and a tenaille. A ravelin was hastily constructed months before the 1565 siege. In 1565, the Ottomans invaded Malta once again with much more force than in 1551, in the Great Siege of Malta. Fort Saint Elmo was the scene of some of the most intense fighting of this siege, and it withstood massive bombardment from Turkish cannon deployed on Mount Sciberras that overlooked the fort and from batteries on the north arm of Marsamextt Harbour, the present site of Fort Tigné. The initial garrison of the fort was around one hundred and fifty knights and six hundred soldiers, the majority of which were Spanish, and sixty armed galley slaves. The garrison could be reinforced by boat from the forts across the Grand Harbour at Birgu and Senglea. During the bombardment of the fort, a cannon misfired and hit the top of its parapet, sending shards in all directions. Debris from the impact killed the gunner and mortally injured the corsair and Ottoman admiral Turgut Reis, one of the most competent of the Ottoman commanders. The fort withstood the siege for 28 days, falling to the Turks on 23 June 1565. 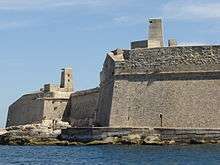 None of the defending knights survived, and only nine of the Maltese defenders survived by swimming across to Fort St. Angelo on the other side of the Grand Harbour after Fort St Elmo fell. The long siege bought much needed time for the preparation of the other two fortresses and the arrival of reinforcements from Spain, which drove the Ottomans off of Malta in a bloody massacre. After the siege, Grandmaster Jean Parisot de Valette decided to build a new city on the peninsula. Construction started in 1566, and Francesco Laparelli was sent by the Pope to design the fortifications. The ruined Fort Saint Elmo was rebuilt and integrated within the city walls. The Carafa Enceinte. The towers on top of the bastions are concrete coastal defences built in World War II. The fort was modified a number of times in the 17th century. The Vendôme Bastion was built in 1614, and in 1687 the Carafa Enceinte was built on the foreshore surrounding the entire fort. In the late 17th century, the fort was directly linked to the cavalier and part of the ditch was filled in burying some of the original ramparts in the process. In the 18th century, a new polverista was built in the Vendome Bastion, and stores were built in the area between the main fort and the Carafa Enceinte. These are known as Pinto Stores and they and the surrounding area form what is known as Lower Saint Elmo. On 8 September 1775, Fort Saint Elmo was captured by 13 rebel priests along with Saint James Cavalier in what became known as the Revolt of the Priests. 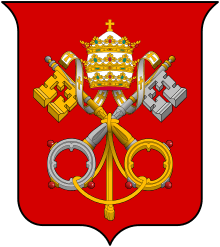 The Order's flag was lowered and a banner of Saint Paul was raised instead. The Order managed to recapture St Elmo so the rebels in control of St James surrendered as well. Eventually the rebels were tried and three were executed while the others were exiled or imprisoned. The heads of the three executed men were displayed on the corners of St James Cavalier, but were removed soon after Emmanuel de Rohan-Polduc was elected Grandmaster in November of the same year. The fort was once again modified in the early 19th century by the British, when a musketry parapet was built. In 1855, the polverista at Vendome Bastion was converted into an armoury, and some small arms from the Palace Armoury were transferred there. In the 1870s, more works were done on Abercrombie's Bastion. In 1917, the first heart operation to be performed on a soldier was done at St Elmo. In the interwar period gun emplacements were built to house new twin 6-pounder QF guns. The fort was the site of the first aerial bombardment of Malta on 11 June 1940. Among the people that were in the fort during the air raid was the military doctor Ċensu Tabone, who later became President of Malta. He survived the attack, but six others were killed in the same air raid. On 26 July 1941, the Italians launched a seaborne attack on the Grand Harbour with two human torpedoes, four MAS boats and six MT boats. The force was detected early on by a British radar facility, and the coastal artillery at Saint Elmo opened fire when the Italians approached to close range. In the attack, 15 men were killed and 18 captured, and all the human torpedoes and MT boats, along with two of the MAS boats were lost. One of the MT boats hit Saint Elmo Bridge, which linked the breakwater with the tip of the peninsula near the fort, and the bridge collapsed. The bridge was never restored, and it was only in 2012 that a new one was built in its place with a similar but different design. Parts of the fort were severely damaged during the war and some scars of the bombing can still be seen to this day. 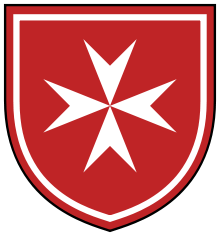 The Royal Malta Artillery left the fort on 26 March 1972, ending its long military history. Parts of the fort subsequently fell in disuse. 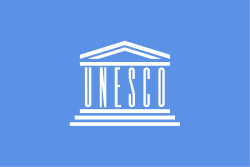 The World Monuments Fund placed the fort on its 2008 Watch List of the 100 Most Endangered Sites in the world because of its significant deterioration due to factors such as lack of maintenance and security, natural aging, and exposure to the elements. Since 2009 major restoration works began, and as of 2014 the restoration of Upper Saint Elmo and the Carafa enceinte was nearly complete. Restoration work was completed in 2015. Lower Saint Elmo has been cleaned from the waste that accumulated over the years, and the Grand Harbour Regeneration Corporation is making plans to begin restoration. From 1975, part of the fort housed the National War Museum, which contained military equipment and other things related to World War I and II. A replica of the George Cross that was awarded to Malta by King George VI in April 1942, was also on display in this museum. The museum closed in September 2014, and reopened in May 2015 having a larger collection. Since the mid-20th century, Fort Saint Elmo has also housed Malta's police academy. Other parts of the fort are used for In Guardia and Alarme military reenactments. While the fort was being restored, some archaeological excavations were made and various elements of the original pre-1565 fort were uncovered. This was an important find because very little remains of the original fort exist, mainly since most of it was rebuilt by Laparelli in 1566 and it underwent a lot of renovation between the 17th and 19th centuries. In November 2015, the fort was used as a media centre for the Valletta Summit on Migration. Foreign journalists stated that it was possibly "the most stunning venue which ever hosted an EU summit". The original star fort, sometimes known as Upper St. Elmo to distinguish it from the rest of the fort, consists of two demi-bastions, two flanks and two faces, a parade ground, barracks and a large cavalier. The fort included a ravelin in 1565, but this was demolished during the fort's reconstruction after the siege. After the fortifications of Valletta were built, Vendôme Bastion was constructed in 1614 linking the French Curtain to Fort St. Elmo. The bastion contains an echaugette, and it was eventually converted into a magazine, and later an armoury. The bastion is now part of the National War Museum. St. Gregory Bastion – an asymmetrical bastion with a long left face. It was altered by the British to house QF 6 pounder 10 cwt guns. St. Gregory Curtain – a curtain wall linking St. Gregory and Conception Bastions. It contains various British gun emplacements. Conception Bastion, also known as Ball's Bastion – a small pentagonal bastion, containing a number of gun emplacements, magazines, and gun crew accommodation. Sir Alexander Ball was buried in the salient of the bastion. Sta. Scholastica Curtain – curtain wall linking Conception and St. John Bastions. It contains a gun emplacement for a RML 12.5 inch 38 ton gun, as well as other British modifications. St. John Bastion, also known as Abercrombie's Bastion – a large asymmetrical bastion at St. Elmo Point, the tip of the Sciberras Peninsula. The bastion contains several British gun emplacements and magazines. Sir Ralph Abercromby was buried on the bastion. St. Ubaldesca Curtain, also known as Abercrombie's Curtain – a long curtain wall linking St. John and St. Lazarus Bastions. It contains a number of British gun emplacements. Some barrack blocks are located in the area between Upper St. Elmo and the Carafa Enceinte. Lower Saint Elmo was used as a film location for the Turkish jail in the 1978 film Midnight Express. The fort is mentioned in the 1980 thriller novel Man on Fire by A. J. Quinnell. The main character Creasy trained with the AFM inside the fort. Fort Saint Elmo was featured on Maltese stamps in 1980 and 2003, and on a UNESCO stamp in 1981. Popular Maltese folk band Etnika gave three concerts on 31 July, 1 and 2 August 2003 named Bumbum, that drew thousands of revellers to listen to modern Maltese folk music. In the popular real time strategy game released in 2005, Age of Empires III, the first level's task is defend a fort on Malta against the Ottomans, which appears to be Fort St. Elmo. 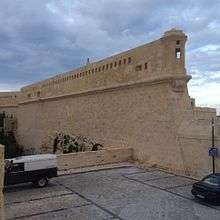 The first part of the music video of the 2008 song Vodka by the Gozitan singer Morena was filmed at Lower Saint Elmo (the same part of the fort that was used for Midnight Express). The fort is also mentioned in the 2014 Honorverse novel Cauldron of Ghosts by David Weber and Eric Flint, as part of a list of 'last stands' throughout history. 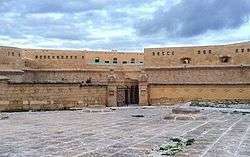 The fort is also plays a key role in the novel Sword and Scimitar by Simon Scarrow. 1 2 3 "Fort St. Elmo" (PDF). Heritage Malta. Archived from the original (PDF) on 6 December 2013. ↑ "Fort St. Elmo". Visit Malta. Retrieved 5 October 2014. 1 2 Spiteri, Stephen C. "In search of Fort St Elmo 1565". Military Architecture. Retrieved 5 October 2014. ↑ "Fort St. Elmo Project" (PDF). Department of Information. Retrieved 9 October 2014. ↑ Sciberras, Sandro. 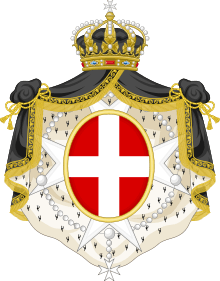 "Maltese History - E. The Decline of the Order of St John In the 18th Century" (PDF). St Benedict College. Retrieved 30 September 2014. ↑ "First heart op on soldier was performed in Malta in WWI". Times of Malta. 6 January 2014. Retrieved 5 October 2014. 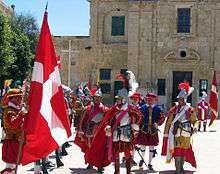 ↑ "Poignant ceremony recalls Malta's early war victims - Censu Tabone's close escape". Times of Malta. 11 June 2014. Retrieved 5 October 2014. ↑ Vella, Annette (25 July 2012). "Fort St Elmo is finally linked to the breakwater". di-ve.com. Retrieved 9 October 2014. ↑ Ameen, Juan (18 February 2009). "Government unveils multi-million Fort St Elmo restoration job". Times of Malta. Retrieved 5 October 2014. ↑ Micallef, Keith (26 March 2014). "Iconic fort is nearly back to former best". Times of Malta. Retrieved 5 October 2014. ↑ "Updated - Upper Fort St Elmo restoration nears completion". Times of Malta. 4 November 2014. Retrieved 5 November 2014. ↑ "Fort comes back to life". Times of Malta. 9 May 2015. Retrieved 9 May 2015. ↑ "Lower St Elmo to be cleaned". Times of Malta. 14 November 2014. Retrieved 14 November 2014. ↑ "Request for proposals for restoration of lower Fort St Elmo published". Times of Malta. 28 October 2015. Retrieved 29 October 2015. ↑ "National War Museum". Heritage Malta. Retrieved 5 October 2014. 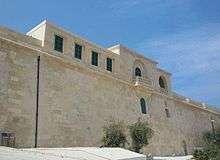 ↑ "New Military History Museum to open at Fort St Elmo". Times of Malta. 4 September 2013. Retrieved 5 October 2014. ↑ "Fort St. Elmo Opening". Valletta 2018. Retrieved 8 June 2015. ↑ "In Guardia Parade". Heritage Malta. Retrieved 9 May 2015. ↑ Attard, Rachel (31 October 2015). "8,000 people, many heads of state participating in Valletta Summit on Migration and CHOGM". The Malta Independent. Retrieved 12 November 2015. ↑ Grech, Herman (12 November 2015). "Live commentary: Valletta summit sounds warning on Schengen, provides aid to Africa". Times of Malta. Retrieved 12 November 2015. ↑ "Vendôme Bastion - Valletta" (PDF). National Inventory of the Cultural Property of the Maltese Islands. 28 June 2013. Retrieved 11 July 2015. ↑ "St Gregory Bastion - Valletta" (PDF). National Inventory of the Cultural Property of the Maltese Islands. 28 June 2013. Retrieved 11 July 2015. ↑ "St Gregory Curtain - Valletta" (PDF). National Inventory of the Cultural Property of the Maltese Islands. 28 June 2013. Retrieved 11 July 2015. ↑ "Conception Bastion - Valletta" (PDF). National Inventory of the Cultural Property of the Maltese Islands. 28 June 2013. Retrieved 11 July 2015. 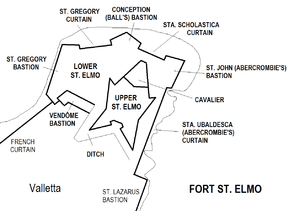 ↑ "Sta Scholastica Curtain - Valletta" (PDF). National Inventory of the Cultural Property of the Maltese Islands. 28 June 2013. Retrieved 11 July 2015. ↑ "St John Bastion Caraffa - Valletta" (PDF). National Inventory of the Cultural Property of the Maltese Islands. 28 June 2013. Retrieved 11 July 2015. ↑ "Sta Ubaldesca Curtain - Valletta" (PDF). National Inventory of the Cultural Property of the Maltese Islands. 28 June 2013. Retrieved 11 July 2015. ↑ "Prison break at Fort St Elmo". Times of Malta. 2 August 2008. Retrieved 5 October 2014. ↑ Modifications continued until the early twentieth century. Wikimedia Commons has media related to Fort Saint Elmo.